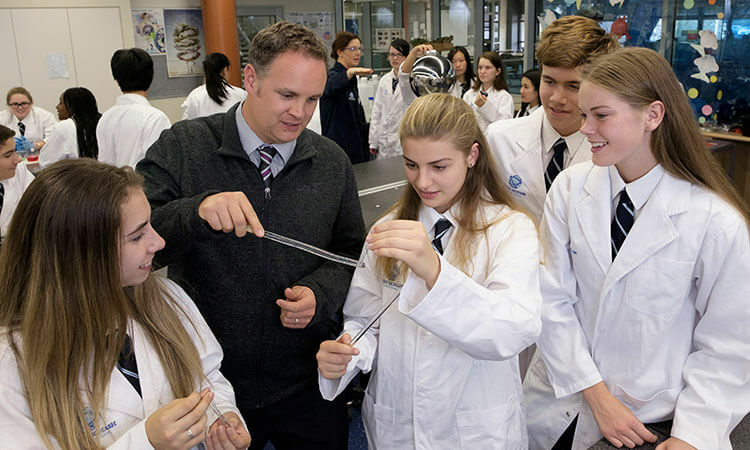 John Monash Science School (JMSS) is Victoria’s first specialist secondary school focusing on science, mathematics and associated technologies, accommodating up to 640 students across Years 10, 11 and 12 (VCE). Curious students who are problem solvers with a real passion for science are selected for entry after analysis of written assessments, group activities and interviews. Co-constructed with Monash academics, the curriculum at JMSS allows students to explore the cutting-edge of scientific knowledge and understanding in the areas of physics, chemistry, biology, earth science, mathematics, engineering, biomedical science, geography and computer science. Throughout Years 10–12 the school has implemented the Victorian Essential Learning Standards (AusVELS), the Victorian Certificate of Education (VCE) and the new National Curriculum, along with a range of university extension subjects that are offered to students in the senior years. In addition to core curriculum, students have access to a range of co-curricular options, including opportunities to pursue learning in languages, music, the arts, community service, leadership and sport. 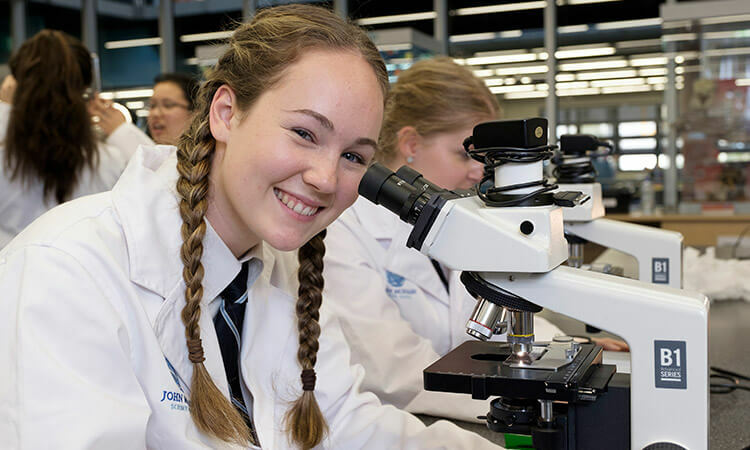 To further support student learning, JMSS has developed strong partnerships with researchers and academics across a broad mix of scientific fields at both Monash University and CSIRO – sharing resources and expertise and ensuring the courses offered at JMSS are rich, challenging, contemporary and relevant. A strong support system underpins teaching, learning and daily school life at JMSS. Each student is allocated to one of four houses for their entire time at JMSS, providing access to a dedicated mentor teacher and team of house leaders, who also remain with them for the duration of their study. Mentors are the first port-of-call for parents and students, and are responsible for overseeing each student’s day-to-day progress and well-being. In addition to the support of the house system, the school has a well-developed Mindfulness program, complemented by an emphasis on positive education both inside the classroom, and further into the school community. JMSS continually strives to provide an environment where students are encouraged and supported to follow their passions not only into their learning and academia, but into life. The physical environment at JMSS is very different from traditional schools. Flexible learning spaces, combined with innovative team teaching practices, enable students to learn individually and in teams. Students use laptops, tablets, iPads and smartphones to research, problem-solve, organise, document, analyse, present and create digital objects, as well as to access references and resources. All students develop individual learning portfolios informed by their own interests and abilities, and are frequently afforded opportunities to engage with lectures, research and experiential learning within the Monash University campus. JMSS is co-located on Monash University’s Clayton campus in Melbourne’s south-east. The university is serviced by several metropolitan bus routes, while Huntingdale and Clayton train stations are also nearby. The school’s growing outreach program includes work with students and teachers from remote locations in regional Victoria and outer-metropolitan Melbourne, as well as local primary schools. 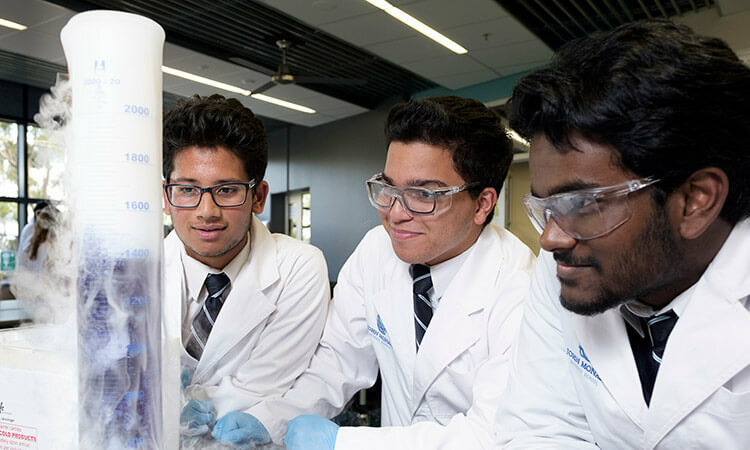 A founding member of the International Science Schools’ Network (ISSN), our partnerships with several international science schools provide our students with additional opportunities to participate in a number of international exchange programs and science fairs. All prospective students, along with parents and family members are invited to attend our school Information Night, which usually occurs in April/May of each year.